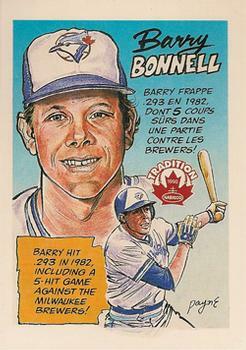 Bonnell came over to the Jays in the Chris Chambliss trade in 1980 I mentioned last week. He was here for four years, the high point of his career. As a Jay, he put up a 3.4 WAR, slashing .281/.331/.416. (You can see his complete stats here.) He played all three outfield positions as well as third base. His tenure here was marred by injuries (fractured left cheekbone when HBP in August 1980, strained knee tendons just after the return from the strike in 1981) but he showed signs of brilliance. In the first week of June 1982, he was baseball's batting leader, hitting .389 at a time where the league averages were floating around .260. Hit 2 triples against Oakland in a 9-1 win on June 16, 1983. That ties a team record. Hit 3 doubles in a 5-3 win over Cleveland on April 20, 1980. With Dave Stieb pitching a 5-hit shutout, hits a grand slam on a full count in the 9th to put the Jays on the board and beat the Brewers on April 26, 1980. 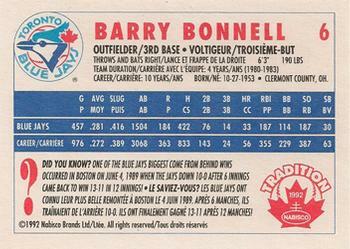 Hits a grand slam to cap off a 8-run inning in support of a Dave Stieb 3-hitter against the ChiSox on May 1, 1983. In the 1983 offseason he was traded to Mariners for relief pitcher Gas Can Bryan Clark, who ended up having a horrible year in '84 and was released in spring training the following year. The trade looks bad on the surface but Bonnell had asked to be traded at the end of the 1982 season while negotiating a new contract after Beeston and Gillick told him he'd have to give up his hobby flying. He resigned for three years a couple of months later but you have to think there was some bad blood. I couldn't even hold the bat up without my arms shaking," he said. "Finally, I said, 'This is something else.' I went in and they did a chest X-ray and it looked like spider webs in there," he said. "It took me a whole year to recover from that. That was pretty much it for me. I played out my contract and I was a bit player the next two years. I had some opportunities to continue on, but I decided I'd rather be with my family and pursue other interests. And what a wide range of interests it has been. He did try to turn his flying into a career. He took the certification but thanks to a couple of smaller airline failures there was a glut of pilots looking for jobs so he turned elsewhere. He went into the home medical care field for decade working for Home Safe Oxygen, which became part of Lincare. From there he created an import company called World Wide Premiums (which now seems to be a writing and editing company he has nothing to do with) that mainly traded in school items (like Backstreet Boys lunchboxes), sold to low-end retailers. He left that in 2005. He's been coaching youth baseball teams for years, and he's still doing clinics. He's part of a management team for a company called Roy's Boys Pet Toys, which is looking for investors. The website describes the products as "the 'Skunk Works' of pet toys. We are in the business of creating unique, pet-activated devices that exercise, entertain, and educate pets, as well as ease the chores of pet caretakers." We want characters that are gifted with mystical power drawn from the Guardians and Goddesses of authentic folklore--so that’s what Enchanted Notions is all about. Turns out it's based on an actual store, Enchanted Moments, in his hometown Milford, Ohio. On his website, he's looking for representation for his memoir. In the description there's a hint of what may have happened. The entire book is set at my Mom's kitchen table, on the day of her funeral, when memories helped me discover my true self. I learned what motivated me, and how those motivations caused me to perform for the praise of others more than for love of sport, or of God. My inner self came to the surface revealing that most of what I'd accomplished was irrelevant. My new life started that day at Mom's kitchen table. We hear a lot about how things change for people once they leave the game but it's not often we get a chance to know. You can read a teaser here. Hitting mechanics have evolved into two competing schools: “rotational,” populated by devotees of Ted Williams, and “linear,” by followers of Charlie Lau. Theses two camps argue with great enthusiasm for their respective causes - with the close-minded stubbornness of political parties. While this controversy rages, hitters suffer from partial understanding. Full understanding is required for hitters and hitting instructors to reach their maximum potential. The problem with both schools is that many examples of excellent hitting can be found in either of them. Each discipline has its superstar athletes with superstar numbers to refute the other. My premise is that neither school can claim to have the definitive style because there are superstars who hit with rotational mechanics (Albert Pujols) and other superstars who use linear mechanics (Ichiro Suzuki). Many have traits of both schools, so, it seems logical that both camps have excellent points. There should be a way to explain the successes, and failures, of both systems. My method of understanding, critiquing, and improving a swing does exactly that. I call it the Correct Performance Zone(sm) method and it explains how hitters can be successful in both schools of mechanics. The truth is that both schools perform WITHIN certain Correct Performance Zones(sm) that will be quite evident once the reader learns what they are. This book will teach you how to critique and improve ANY swing, including your own if you are a player. Coaches will be better hitting instructors, players will be better hitters, and parents will know that their children are getting the best instruction available. Once we know what is really going on, we can stop arguing about which school is best, and use the one, or parts of both, that best suit the hitter’s own native capacities. And yes, he's working on a blacksmith how-to book as well. Congratulations #BlueJays! I was one, back in the day.